Go to any motorcycle specific website and you’ll find what are often referred to as “recurring, never ending topics” and most of them revolve around either tires or motor oil. Ask the question “what’s the best tire or oil for my bike” and you’ll get flooded with replies, each claiming to have the best answer. I can just see the oil and tire manufacturers rolling their eyes. Isn’t the Internet great? The downside to this is there’s also a lot of misinformation out there too. On the topic of tires, how many riders faithfully replace the tires on their bikes with the same brand and model that it came with, either because “that’s what the bike came with and what the dealer advises” or they’re just afraid to try something else. Some of us humans just don’t like change. We’re comfortable with how things are now, so why change? What if another tire doesn’t handle as well or wears out sooner? Regardless of how often you ride, handling is always paramount, but for the average US rider, who only puts around 2,600 miles in a year on a bike, then the wear factor isn’t going to be as big of a concern. But, if you do ride a lot, then tire life does become an important factor in the equation. Are there tires out there that provide good grip even in the wet, yet return decent tire life? This is what tire manufactures are constantly working on, and compared to 20 years ago, today’s street tire compounds are incredible. So back to that question, “what if it doesn’t handle as well”? Well, the possibility does exist that there is an even better tire out there than the one you’re using now, right? That was the question for my ’06 Yamaha FJR1300A. I had replaced the original Metzler Z6 Roadtec tires with the same after getting a little over 9,000 miles on the pair (which is nothing to turn your nose up at for a Sport Touring tire) and now closing in on 18,000 it was getting close to replace them once again. I have been pleased with the performance of the Z6’s, but wouldn’t this be a good time to explore my options? 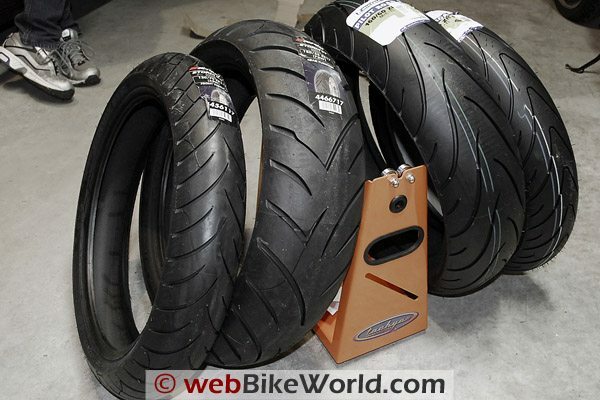 Doing some research, I noticed that the Avon Storm ST tires were getting some very favorable feedback on the FJR forums. There were a few postings by some riders who had experienced defects in the tires, but not enough to give me concern. I’ve had tires of other brands slip a belt, but it has happened so infrequently I decided not to let that deter me from giving them a try. 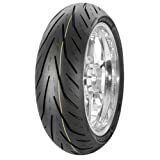 The new Avon Storm ST tires are officially called the Avon Storm ST Sport AV55 (front) and the Avon Storm ST Sport Touring Radial AV56 ST (rear). Avon Tyres (UK) says that this is their “long-lasting, all-weather, high performance sports touring tyre” that incorporates the Avon “Reactive Footprint”. Avon says the Storm ST’s have “excellent performance combined with very long life ‘Super-Rich Silica’ rubber compound” to give “superb wet road grip”, while the front tread pattern is “optimized for for shorter stopping distances in the wet”. The Storm ST replaces the Avon Azaro ST, which Rick used on the Triumph Thunderbird Sport to good effect. Rick was kind enough to piggyback an order of Avon Storm ST’s for the FJR at the same time he bought the Michelin Pilot Road 2 tires from RevZilla, and I performed the tire replacement on the FJR by myself a week or so prior to the joint effort on Rick’s Multistrada. Needless the say, with no distractions, the process went smoothly and far quicker than it took to do the tires on Rick’s Multi — get two motorcycle gear-heads together and we can turn a two-hour job into an all day affair! Avon Storm tires on the left; Michelin Pilot Road 2 (review) on the right. Since the procedure for dismounting and mounting tires was previously covered in the review on the No-Mar Tire Changer, I won’t repeat it here and will cover the basics of removal, balancing and installation on the FJR. 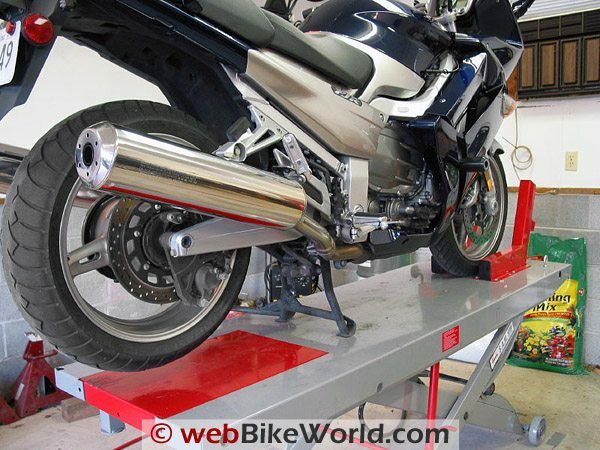 Removing the tires on some motorcycles is a snap (such as the rear wheel on my BMW with the single-sided swing arm), while others are a downright nuisance. For most it’s not a difficult job, but chances are it’s going to require a few tools you might not have in your toolbox, so you may want to scope out what’s needed and get them off BEFORE you dive in for the first time. And get yourself a manual. A good manual will help guide you through the task and has all of the necessary torque specs to complete nearly any repair or maintenance job. Remember, I’m using my FJR which has shaft drive for this description, so your bike could very well be different. The FJR also has a center stand, which will keep the bike stable side to side. If your bike does not have a center stand you’re going to have to come up with a way to keep it steady throughout the entire process. FJR 1300 rear swingarm and axle. Starting off at the rear and with the bike held steady, loosen the axle nut and the pinch nut. Once loose, lift the chassis just enough so the tire is barely touching. Finish loosening the axle and slide it out while paying close attention of any shims, their thickness and location. Take a digital photo of the before or draw a picture if you need to — just make sure they go back in EXACTLY the same position. FJR 1300 rear wheel removal, final drive and splines. The rear brake caliper bracket is often on some sort of floating arrangement that can be slid out thus providing room to remove any spacers, or in my case the rear ABS sensor hub. With these out of the way the wheel can be moved to the side, away from the splined hub (photo above), and rolled back out from under the rear fender. Depending upon how low the rear fender is on your bike, getting the tire out from underneath could be a real problem. My Handy Motorcycle Lift happens to have a removable “drop” that, when removed, allows a wheel to be lowered out the bottom. By he way, remember not let brake calipers hang by their hoses. 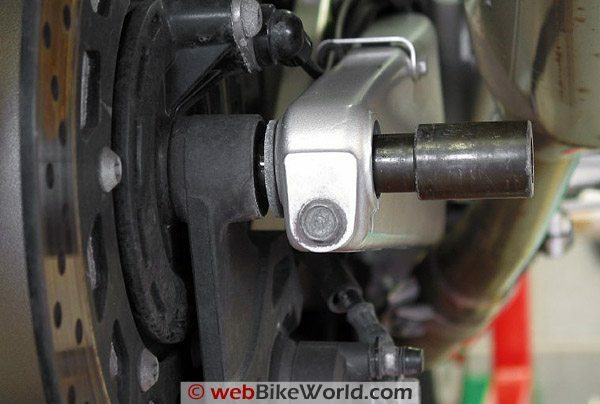 Tie them up, or just bolt them back in place which you can easily do on the front forks once the wheel is off. Front axle pinch bolts at bottom of front forks. The front wheel comes off in a similar manner with pinch bolts and a central axle bolt (photo above). Most motorcycles use this type of arrangement, like the Multistrada 620 (Blog), GT1000 (Blog), Triumph Thunderbird Sport and Triumph Tiger, BMW R65 and many others. The biggest difference in the front is that you’ll most likely have to unbolt the brake calipers and carefully push the pistons back into the caliper so you can sneak the caliper off the rotor and out from the wheel. I use to use a pair of Channel Lock pliers with the jaws wrapped with duct-tape to do this, but I’ve since learned that gently rocking the caliper back and forth on the brake rotor the pads will push the pistons back nicely. Speaking of brakes, this is a great time to get a close look at the brake pad thickness and condition because it would be simple to address them now if needed. And by the way, to make it easier to remove the brake calipers, it may also be necessary to remove the front fender, which is usually held on with a couple of screws. It’s then usually pretty easy to simply slide the fender out from between the front forks. When removing the front tire, once again you will need to support the weight of that end of the bike just enough so the tire is barely touching. I use a block of wood against a solid part of the engine, transmission or frame and a simple scissors jack underneath to manipulate the weight and hold the bike up just enough to slide the front tire out. Depending on your bike and equipment, you may be restricted to removing only one tire from the bike at a time. See the review on the No-Mar Tire Changer for the procedure on dismounting and mounting tires. With the new tires mounted it’s time to balance them. We covered this in detail in the recentTachyon Tire Balancer review and the No-Mar tire changer review, both of which now have videos showing the products in use. I found the balancer by Tachyon to do an excellent job and to be more accurate and sensitive than the balancer I had been using. I have also found that changing the tires is an ideal time to give the wheels a good cleaning or a coat of wax if they’re painted. It’s so much easier to get your hands and fingers inside the spokes to reach all of the dirty areas than when the wheels are mounted on the bike. Installing the wheels back on to the bike is pretty much a reversal of the removal process, with the exception of specific tightening sequences for axle bolts and pinch bolts. Of course, if you’ve got a chain, you’ll have to adjust the tension and check the rear wheel alignment. 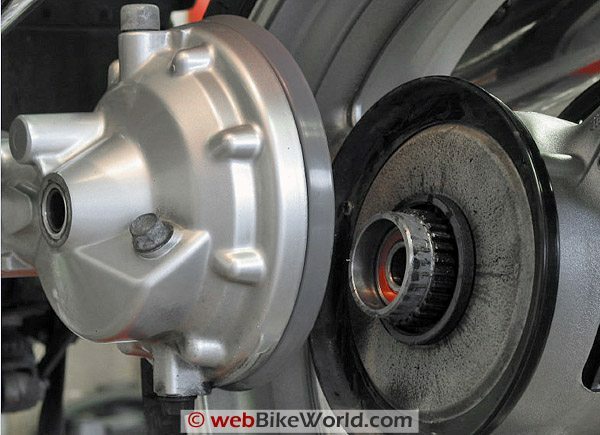 If the motorcycle has shaft drive and depending on the design, it may be a good idea to grease the splines with the appropriate lubricant (more). There’s one thing you need to be sure to do with the front wheel. 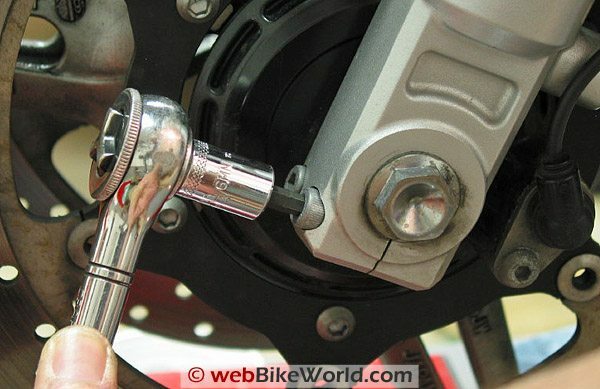 Usually after applying torque to the front axle bolt, but before the pinch bolts are tightened, the front forks need to be compressed several times by holding the front brake lever and vigorously pushing down on the front suspension three or four times. This helps ensure the forks are aligned with each other and aids in reducing “stiction” (a binding like friction in the front forks. Of course there’s the matter of the mold release, that slippery coating on every new tire. I noticed Rick drew a few comments in the Michelin Pilot Road 2 review comments about going overboard on scuffing the new tires prior to taking to the streets. But I don’t think you can be too careful — too many riders have had slide-outs and have been injured because of slippery new tires. So why not take a couple of minutes to reduce the risk of a crash by simply roughing up the tread area? Of course, you will still want to take it easy for a couple of hundred miles before you start pushing the tire through its paces. So how do the Avon Storm ST’s perform? I noticed right off that the bike felt planted whether it was straight line riding or cornering. The usual twitchiness that I usually notice with a new set of tires was not present. I’ll have to wait to see how they hold up over time, though. Editor’s Note: Chris sold the FJR not long after this article was written, and he bought a BMW R11150GS to replace it! (Corrected from original, which said R1200GS). So although we may not learn of his final impressions of the Avon Storm tires, we’re looking forward to some new articles about the new GS! If you can provide some feedback on the Avon Storm ST tires, please send it to us at the email address below. Thanks! If you’re in the market from a set of Sport Touring tires you may want to give the Avon Storm ST’s a look-see. Pricing seems to be comparable to similar style tires. Who knows, you may very well find the tire that better suits your needs. From Phil Cooper, Administrator, DeauvilleUK.org (9/09): “As an administrator of the Deauville forum, I just read with interest the (Avon Storm article) to which I would just like to add that they are the tyre of choice for Deauville riders, both 650 and 700 versions. The forum has a number of FJR and Pan European owners and they also rate them highly, but, wear rates are higher than on the Deauville as these bikes have more power and heavier front end weight than the Deauville. From “J.B.” (August 2015): “Was recommended by Honda Dealer to install a set of Avon’s on my ST1300 in 2012. Didn’t ride the ST1300 much for 2 years. On a recent trip from Winnipeg, Manitoba to Victoria, British Columbia Canada, the Rear Avon failed at hiway [sic] speed. Total wear at this point is just over 10,000 km (6,200 miles). Editor’s Reply: There are many reasons why a tire could fail. One key thing is to check the manufacture date molded on your tires. It could easily be that your tires were 2 years old when you bought them, having been in inventory that long or longer. Then the bike wasn’t used much for another couple of years. I probably would have replaced the tires before taking a long trip, especially with 5-6,000 plus miles already on the tires. Or, you could have simply run over something on the road that caused the failure. Or a combination of low pressure and all of the above. To be honest, I doubt very much that the dealer or manufacturer will replace the tires, unless you’re very lucky or have a good dealer. Not blaming you; just saying that there are many things that can cause a failure. 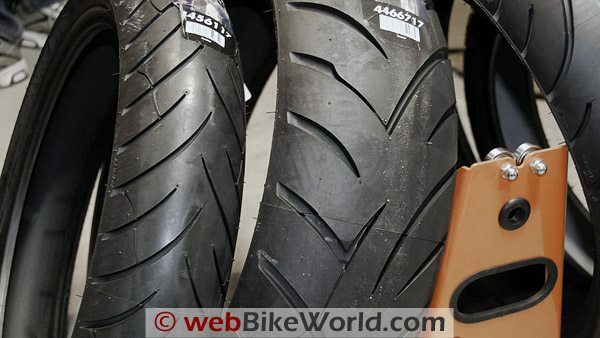 Tire age is very crucial with motorcycle tires. Avon AV55/56 performance: A. Tread Life: rear 4600 (had to change because of a nail – it had maybe another 1k left) front (after 4000 miles it was replaced under warranty because of a defect). Price per set wo labor: $276.00 customer service: A++++!!!!!! From “M.H.” (3/09): “I tried the Avon Storms on my Kawasaki Concours 14. They have only lasted 3,700 miles. Sadly the middles are worn down to no tread at all, on both front and rear. And the wear doesn’t happen gradually, it kind of accelerates. From “M.P.”: “Was looking at your site like I do at some point most weeks and noticed you had looked at the Avon tires. I am running a pair of these on my ’02 R1 and they are holding up quite well. I had been running the Michelin Pilot Power tires but they go quick and since I am not riding track and live in (Florida) I thought I would give a sport touring tire a try. I have about 3000+ miles on them so far and they have LOTS of tread left. I actually took the bike up to the (North Carolina – Tennessee) mountains a few weeks back and they held quite well there though I am not leaning over as good as a lot of those guys on 129 do. I went with Avon Storms last March, ’17, front and back on my FJR 06. The front lasted to 11000km before I replaced it because of wear and cupping. Not the 20k I had hoped for. The rear is now on to 17000km and I’ll start a major trip around North America with it on in March ’18.